The Centre for Sustainable Design has formed a strategic partnership with Kluwer Academic Publishers to further develop the Journal of Sustainable Product Design. For more information visit their website: http://www.wkap.nl/journals/jspd. To freely download former issues of the Journal click here. What is The Journal of Sustainable Product Design? 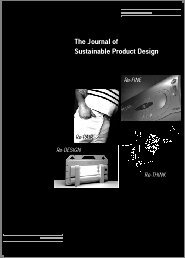 The Journal of Sustainable Product Design (JSPD) covers economic, environmental, ethical and social issues in product design and development. JSPD is a comprehensive quarterly journal guaranteeing high quality both in content and in presentation. It is a pioneering publication that examines sustainability issues as they affect product and service design and development worldwide. JSPD provides a platform for organisations and individuals to discuss new solutions although not ignoring the complex issues surrounding sustainability. JSPD's international focus enables business decision-makers and academics to monitor trends as they appear and develop on a global scale, from managing eco-design, life cycle assessment and 'design for dismantling', to eco-innovation, systems change and dematerialisation. JSPD balances practical issues as they affect us today, as well as exploring new ideas. JSPD aims to be the focus for a new vision for product and service development and design that integrates eco-efficiency with social responsibility in the delivery of sustainable solutions. JSPD aims to initiate leading-edge thinking in eco-design, 'design for environment' (DfE) and sustainable product development and design (SPDD). JSPD publishes results and analysis of international multidisciplinary research from materials and engineering to green marketing and stakeholder dialogue. The research and surveys provide an essential source of data for effective decision making. The journal provides a platform for objective analysis, with articles by leading thinkers and practitioners from around the world. This section is peer reviewed by the editorial board. The Journal of Sustainable Product Design encourages responses from it readers to any of the issues raised in the journal. Entries for material to be considered for review should all be sent to the Publishing-Editor at the address below (see Contributor Guidelines). An external panel of business professionals, consultants and academics assesses all articles published. The Journal of Sustainable Product Design is a peer-reviewed, multi-disciplinary journal that focuses on the theoretical, methodological and practical dimensions of sustainable and eco-product and service design and development. The journal is published four times each year and is supported by an international Editorial Board. The editors welcome contributions that are based on solid research, as well as ‘blue sky’ and ‘out of the box’ thinking. The journal provides a forum for leading-edge thought and new ideas. Analysis JSPD aims to initiate leading-edge thinking in eco-design, 'design for environment' (DfE) and sustainable product design. JSPD provides objective analysis, with a large part of the journal devoted to articles by leading thinkers and practitioners from around the world. Case histories Every issue devotes a major section to the practicalities drawn from the real world. This includes examples of how today's companies are designing and developing greener products and services, and how they are managing the eco-design or DfE process. Interviews JSPD conducts interviews with key thinkers and practitioners in eco-design, DfE and sustainable product design. Research SPD publishes results and analysis of international research into key design issues. The research and surveys provide an essential source of data for effective decision making. This section is peer reviewed. Innovation JSPD provides opportunities to present new ideas, concepts and solutions. Gallery The journal provides images of eco-design and sustainable product design and development. Reviews A review section monitors and evaluates newly launched media and resources, including books, videos, training material, conferences, exhibitions, journals, periodicals and Internet sites. Diary of events JSPD provides a comprehensive list of forthcoming worldwide environmental events. Feedback Readers are encouraged to write to the editor with ideas and thoughts. Internet A unique feature of the journal is the downloadable Internet version of the journal, which will be accessible via a password. Guidelines for contributors can be downloaded as either a .txt file or as a MSWord document.